The darker blue curved shape on the right is a piece of the Pacific Plate. Its dark border along the western edge is the subduction zone which runs along northern Japan, then turns south-southeast. Near Sendai is the actual site of the earthquake where the Pacific Plate dives beneath the North American Plate. The triangular area south of Tokyo is the Philippine Sea Plate. 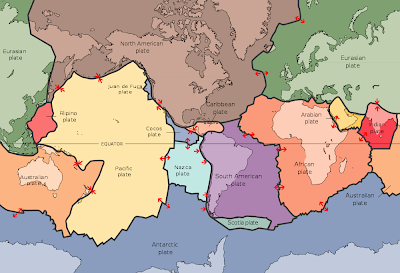 It is bordered by the Pacific Plate on the east and the Eurasian Plate to the west. 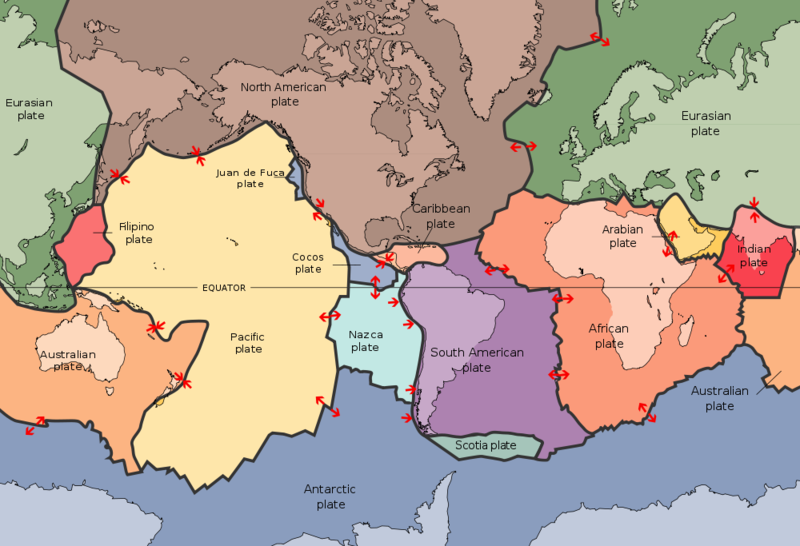 The northern half of Japan sits on a narrow arm of the North American Plate. Tokyo marks the spot where it meets the Philippine Sea Plate. The southern half of Japan and the Sea of Japan northeast of Korea sit on the Eurasian Plate. The outer boundary of the Juan de Fuca Plate is clearly visible. It begins at Cape Mendocino, California and zigzags northwest, ending north of Vancouver Island. Here the light blue defines the continental shelf and the edge of the North American Plate. Notice the indentation of the continent under pressure at this point. The subducting Juan de Fuca is a slowly disappearing remnant of the huge, ancient Farallon Plate which helped shape much of western North America. The Juan de Fuca Ridge that defines the outer boundary is a spreading zone which is squeezing the Pacific Northwest. Rising magma produces undersea volcanoes and super-heated geysers. Research submarines have revealed colonies of tube worms and giant castles created by precipitating minerals. Off Vancouver Island is an undersea city of castles called "Magic Mountain." Fanciful mineral structures extend 150 yards and rise 30 to 60 feet. If you look closely, you can also see the Cascadia Channel. It begins off Willipa Bay in southwest Washington, turns south and crosses the Juan de Fuca Ridge off the southern coast of Oregon. It appears to loop to the west off northern California. Continuing for about 1,300 miles/2,200 km, it is the longest deep-sea channel in the Pacific. It is an undersea canyon created by a turbidity current driven by sediments falling off the continental slope. The Columbia and other rivers begin the process by delivering huge quantities of sediments into the ocean. For those curious about the geology of the Pacific Northwest, these features and more are described in The Restless Northwest by Hill Williams. The book is reviewed at Wild Pacific Northwest.